The first weekend in May was busy for Purdue Veterinary Medicine Dean Willie Reed, who traveled to Michigan State University (MSU), his former employer, and Tuskegee University, his alma mater, to participate in commencement ceremonies and receive special awards. 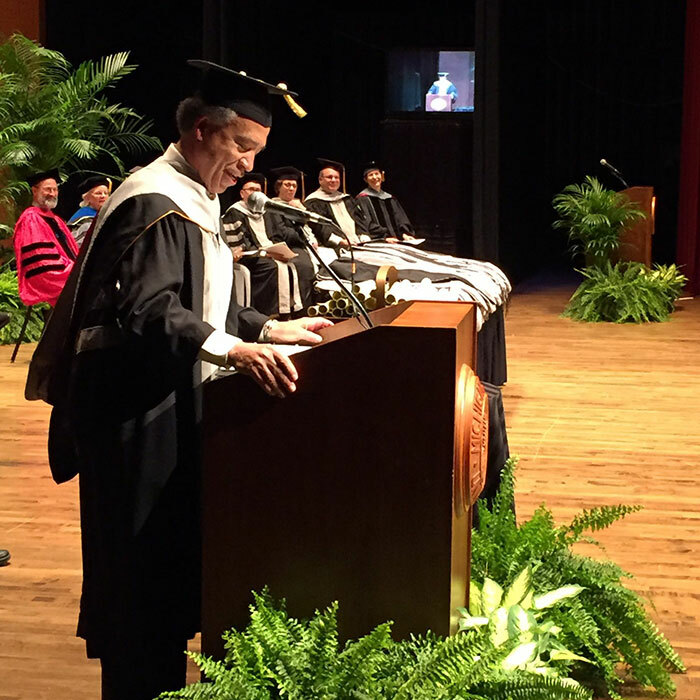 On Friday, May 5, Dean Reed gave the commencement address to the MSU College of Veterinary Medicine's Class of 2017 and received the college's Honorary Veterinary Alumnus Award. Bestowed on a member of the college community who is not an alumnus of MSU, the award recognized Dean Reed for being distinctive and distinguished in one or more of the college's mission areas of teaching, research, or service. The award description reads, "In recognition of sustained excellence over time and the great credit this person has brought to Michigan State University, the college officially names him an honorary alumnus." Dean Reed joined the MSU College of Veterinary Medicine faculty in 1990 as a full professor and director of the Animal Health Diagnostic Laboratory (now called the Diagnostic Center for Population and Animal Health). Later he also was named chairperson of the Department of Pathobiology and Diagnostic Investigation at MSU. He remained on the faculty until his appointment as Purdue Veterinary Medicine dean in 2007. The next day, Saturday, May 6, Dean Reed returned to the Tuskegee University College of Veterinary Medicine for its spring commencement ceremony, at which he was honored as one of three recipients of the Presidential Distinguished Alumni Award. The award is presented to alumni who received their DVM degrees from Tuskegee and are held in high esteem for their contributions to the veterinary profession. The awardees were recognized for their continuous, exceptional loyalty and dedicated service that have significantly advanced Tuskegee University and the College of Veterinary Medicine.